Ellie Blackmore is making a name for herself as a house flipper. But when her sister Mackenzie disappears, Ellie can't focus on anything but uncovering what happened. Her only clue is the bloodstain on the deck of Mackenzie's boat. Ellie knows her sister isn't on the best of terms with her ex-husband, Jason, but he wouldn't kill her-would he? Both Ellie and Grayson want truth, but truth-and family-is often more complex than it first appears. From international terrorism to the peaceful lavender fields of Puget Sound, The House at Saltwater Point is a thrilling race to uncover the truth before it's too late. 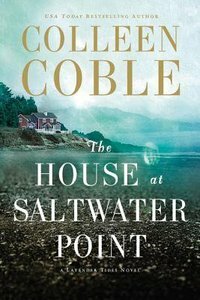 About "The House At Saltwater Point (#02 in Lavender Tides Series)"
Customer Reviews For "The House At Saltwater Point (#02 in Lavender Tides Series)"
What a great weekend I've had enjoying this new addition to the Lavender Tides series by Colleen Coble. Meeting Ellie Blackmore; her sister Mackenzie and her ex husband, and Ellie's business partner, Jason. When Mackenzie disappears, Ellie can't totally focus on her House Flipping Business fully. Jason continues the work to the new house they've purchased at Saltwater Point. What a great Character in Grayson Bradshaw, Coast Guard Intelligence officer. He's determined to find the stolen, seized cocaine shipment that is linked to Mackenzie's disappearance. He just has to tread carefully around Mackenzie's sister Ellie who is convinced she's not involved in the stolen cocaine. Grayson beautifully links us to Shauna and Zach from The view from Rainbow Bay, I'll let you discover the unfolding of their story as it's a great one to read. As Ellie and Grayson both want the truth and the plot develops, can they work together and figure out the truth before the Community that they both love becomes the target for terrorist vendetta? Can Grayson keep a working professionalism until this case is solved? His feelings for Ellie are a unexpected surprise in the middle of a case that demands his attention. Ellie Blackmore is making a name for herself as a house renovator. But when her sister Mackenzie vanishes in disturbing circumstances, Ellie can't focus on anything but finding out what really happened. Did Mackenzie fake her own death? The truth is more complex than anyone could expect.